Last weekend I met Andrew Zimmern and Samantha Brown, which, taken together, is basically the equivalent of meeting Anthony Bourdain. Who am I kidding—it’s not. But the other Travel Channel sweethearts are actually very nice, intelligent people who might deserve a bit more credit and less snark from me and other snarky people like Anthony Bourdain. 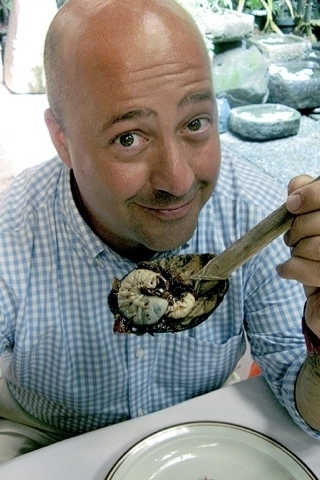 Andrew Zimmern, from "Bizarre Foods"...so freakin' bizarre! These encounters took place at the L.A. Travel & Adventure Show, produced at the Long Beach Convention Center. I worked on the publicity side of the event, organizing interviews and such, so I was working in the press room for the most part but did get to explore the expo during opportune moments, like when they were doling out samples of tequila-lime prawns. Samantha Brown and Andrew Zimmern seemed chummy when they relaxed in the press room with their entourages. 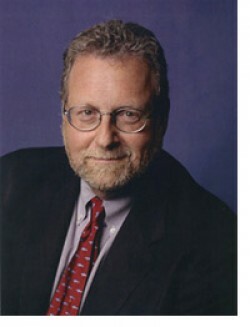 Peter Greenberg, on the other hand, is a very serious travel journalist affiliated with CBS. Not to gossip, but as he relaxed with his assistants in the press room, he commented on Samantha’s lack of journalistic integrity (to paraphrase) while conceding her ability to tell a story. Let’s examine the validity of this claim. Exhibit A: Samantha discusses her hotel room in Vegas, and to convey just how ridiculously extravagant the room is, a photo of the “shower” displays behind her. The shower is so big, there’s a seat in it, and Samantha presumes that the seat’s purpose is to allow the guest to relax while walking from one end of the shower to the other. Many chuckles from the audience. Peter Greenberg wants you to go to Egypt! Now! Americans, especially when it comes to venturing to countries undergoing natural or social instability. “How many people have been to Egypt in the last five months?” he asks. Not enough people raise their hands. Go to Egypt, is Peters advice. The people will love to see you there because you’re the only visitors. You’ll be supporting an economy that could greatly benefit from your spending money there. You’ll come back with unbelievable memories. And so on. The verdict is that I don’t really care who the real journalist is, but both of them made me want to go travel. While the idea behind a travel show is to encourage people to go out and use their passports, domestic destinations were heavily represented, namely California and the Southwest. I picked up some pamphlets from desert cities, including some information on a wildflower festival in April and a flyer for the 10th Annual Joshua Tree Music Festival in May. So you’ll find my camping out in the desert for about a month. Come join me in the Magical Mojave! Cut squirrels up and put in large crock pot with plenty of hot water. Add salt and pepper. Cook on high until meat falls off bones easily (about 6-8 hours). Remove squirrels from water but save the liquid in the crock pot. Remove all the meat off the bones and shred. Put the liquid from the crock pot in a 1 gallon pot. Add 1 teaspoon salt and ½ teaspoon pepper. Bring to a cloil and add rice and squirrel meat. Cook until rice in done. Add water if needed. Should be almost soupy. This works with squirrels, wild turkey legs and thighs, duck, venison or for a mixed flavor dish. I often cook 2 or 3 of the above in the same pot. I have so many questions. What is a cat squirrel? If you don’t shoot them yourself in Union Parish, LA, where the recipe was sourced, will it still be authentic? Can I get them in Los Angeles? What sort of moonshine goes best with this dish? Also, what is the best time of year to visit Union Parish? I’m afraid I left the L.A. Travel & Adventure Show with more questions than answers. I’m glad you had this experience that you can write about and share! I’ll send you pics and stories from Guadalajara and Mazatlan, maybe some recipes too!! I’m leaving for Mexico Feb. 8th.